... In an Economic recession, it takes knowledge to survive. 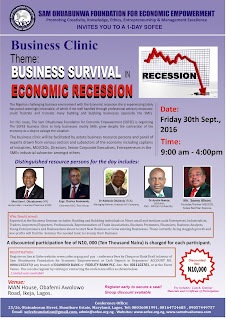 The Sam Ohuabunwa Foundation is bringing to you Experts to help businesses survive in this period. When all is said and done, Atiku Abubarkar , former Vice President, is easily one of the most sophisticated politicians in Nigeria. He is also one of the most experienced, and perhaps since MKO Abiola, one of the most cosmopolitan politicians in Nigeria with tentacles and connections across the length and breadth of Nigeria. Particularly, he seems to be one of the most prepared political leaders of this Nation after the first generation political leaders like Zik, Awolowo and Sir Ahmadu Bello. But since Nigeria's democratic top political leadership seems to often go to the most unprepared, Atiku has been a serial Presidential aspirant, forcing him to criss-cross carpets so often. But to be sure Atiku remains an important constant in contemporary political equations of our Country.